Already in San Juan following the cancellation of Thursday’s stage 12, the duo of Rockstar Energy Husqvarna Factory Racing riders Pablo Quintanilla and Andrew Short are looking forward to the 2018 Dakar Rally’s two final stages. Their main goal for the next two days of racing in Argentina is to climb higher in the rally’s overall standings. 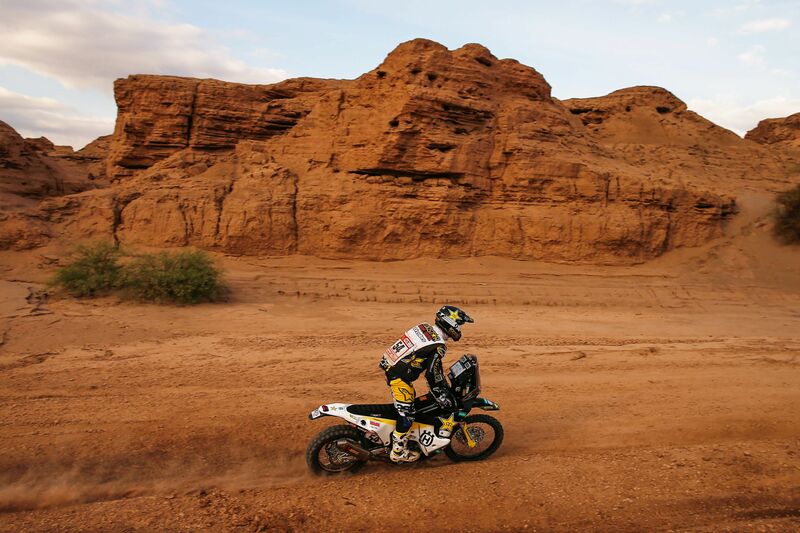 After thousands of racing kilometres across Peru and Bolivia and into Argentina, Rockstar Energy Husqvarna Factory Racing riders have reached the penultimate bivouac of the 2018 Dakar Rally in the city of San Juan. Riding in groups along main roads following the cancellation of stage 12, they reached the San Juan bivouac early in the afternoon and started preparing themselves for the last two stages of the rally. Battling through everything that has been thrown at him, reigning Rally World Champion Pablo Quintanilla is currently placed eighth in the Dakar’s provisional overall standings. Looking for some good individual stage results, the Chilean rally star has his eyes set on getting as close as possible to the top of the leader board. For Rockstar Energy Husqvarna Factory Racing rally rookie Andrew Short, this Dakar has been a huge learning experience. Putting in an impressively consistent performance so far in South America the US racer will look to wrap up his debut Dakar on a high note. Taking racers to the last bivouac of the race in Córdoba, tomorrow’s stage 13 features a 369km timed special, together with a massive 560km liaison section. Download all high-res images from the 2018 Dakar Rally here.